Typical Indian recipe lyophilized. An exquisite blend that will please fans of spicy dishes. 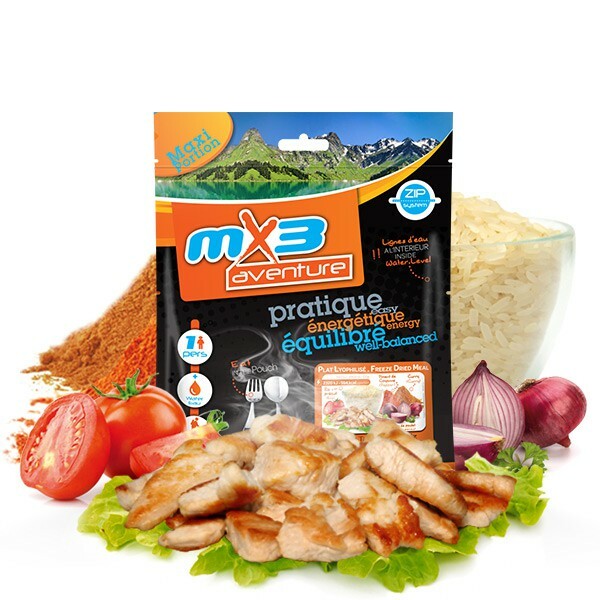 Chicken and Rice Tandoori MX3 is the meal of generous chunks of chicken, rice, tomato and spices. This dish with Indian origins bring an exotic side to your meal surrounded by nature. Spices warm your body. Portion 140 grams. Put water directly into the bag. Mix well, close the bag and stay 10 - 15 minutes. Precooked Rice 43,5%, maltodextrine (maize), chicken 10,7 %, vegetable fat (sunflower oil, glucose syrup, proteins of MILK), tomato, onion, paprika, curry (turmeric, cumin, coriander, cardamom, cinnamon, ginger, hot pepper, fenugreek, fennel, CELERY powder), salt, sugar, flavours, garlic, parsley, hot pepper.